The all-new Volvo XC90 7-seat SUV with a 316 horsepower 2 liter turbocharged and supercharged AWD engine mated to an 8-speed transmission comes well-equipped as a XC90 T6 AWD with a starting price of $48,900. Standard features include Navigation, 19” wheels, a power laminated panoramic sunroof, state-of-the-art car connectivity and with expected best-in-class power and fuel efficiency. 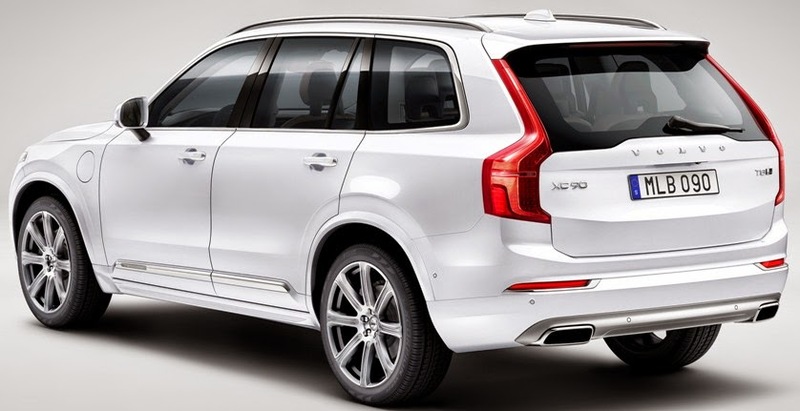 The top of the line 400 horsepower XC90 Twin Engine plug-in hybrid which combines a two-liter, four-cylinder supercharged and turbocharged gas engine with an electric motor. Safety technologies includes a run-off road protection package that detects what is happening and tightens the front safety belts to keep the occupants in position and auto brake at intersection capability. As for sound, the XC90 features an available Bowers & Wilkins 1,400 Watt Class D amplifier and 19 Bowers & Wilkins speakers with air-ventilated subwoofers integrated into the car body, so it turns the whole interior space into a giant subwoofer. The Urban Luxury package combines a color coordinated body kit with polished stainless steel details, such as front deco frames, front and rear skid plates and side scuff plates and 21-inch exclusive polished wheels. The Rugged Luxury kit enhances the ruggedness of the XC90 SUV with tech matte black exterior trim, stainless steel skid plates, running boards with illumination and integrated exhaust pipes coming with 22-inch wheels. A limited First Edition of the all-new Volvo XC90 will have 1,927 individually numbered cars only be available for order via digital commerce at www.volvocars.com/us starting on September 3rd at 10:00 am ET for $65,900 for a fully-equipped XC90 T6 AWD First Edition. 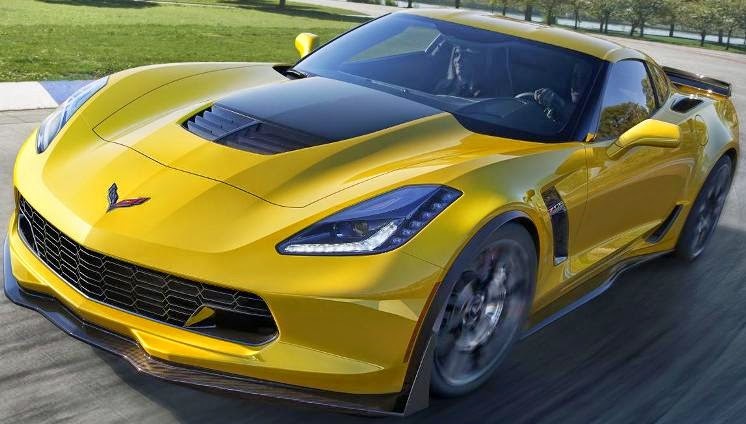 The 2015 Chevrolet Corvette Z06, offered in 1LZ, 2LZ and 3LZ trims, with a 650 horsepower supercharged 6.2L V-8 engine will be offered at a suggested retail price of $78,995, and the convertible model will start at $83,995 (excluding tax, title, license, optional equipment and dealer fees). Available packages include the $2,995 Carbon Fiber Ground Effects package with a functional carbon fiber front splitter, carbon fiber rocker panels and a larger rear spoiler. The Z07 Performance Package for $7,995, adds Brembo carbon ceramic-matrix brake rotors along with adjustable front and rear aerodynamic components to the Carbon Fiber Ground Effects package. The latest redesigned 2015 Volkswagen Jetta with new front, rear and interior styling, and an all-new 2.0-liter turbocharged TDI® Clean Diesel engine with an EPA-estimated highway fuel economy rating of 46 mpg with the manual transmission hits showrooms in the third quarter. 2015 Jetta engines offered are a 2.0-liter naturally aspirated engine, 1.8-liter and 2.0-liter versions of the turbocharged and direct-injection TSI® engine, a 1.4-liter turbocharged hybrid unit and the all-new 2.0-liter turbocharged EA288 TDI® Clean Diesel engine. The entry-level 2.0L trim starts at $16,215 (excluding transportation, taxes, title, options, and dealer charges), with a standard five-speed manual transmission. The S model starts at $18,425 with a six-speed automatic transmission, while the entry-level 1.8T model, the SE, is priced from $18,995 with a five-speed manual transmission. The TDI Clean Diesel model starts at $21,640 for the S trim. In total, the 2015 Jetta is offered in four trim levels, Base, S, SE, and SEL, with a total of 12 equipment levels. A limited-edition Jetta Sport, based on the 1.8T SE with Connectivity, adds a sport suspension, front sport seats, RNS® 315 navigation with rearview camera, rear spoiler, and unique interior decor. When paired with a five-speed manual transmission, the Sport starts at $20,895 and costs $21,995 with a six-speed automatic transmission. The 2015 Volkswagen e-Golf, fully electric vehicle for the U.S. market will start at $36,265 (including $820 destination and delivery) for the SEL Premium model when it hits showrooms in November. 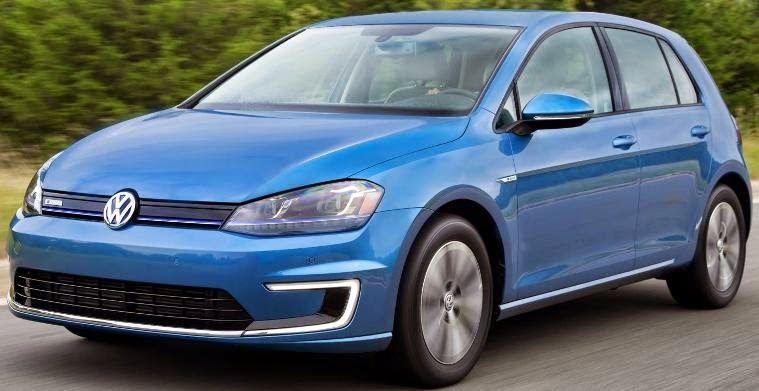 The eGolf, powered by a 115 horsepower compact electric motor and lithium-ion battery, has an average range between 70 and 90 miles, depending on driving style and charging behavior. Amenities include a 5.8-inch touchscreen navigation system and infotainment center, Bluetooth® technology, SiriusXM® Satellite Radio, heated front seats and rearview camera and front and rear Park Distance Control. Chrysler Group announced that effective immediately, Reid Bigland (left) is appointed Head of Alfa Romeo Brand for the NAFTA region. 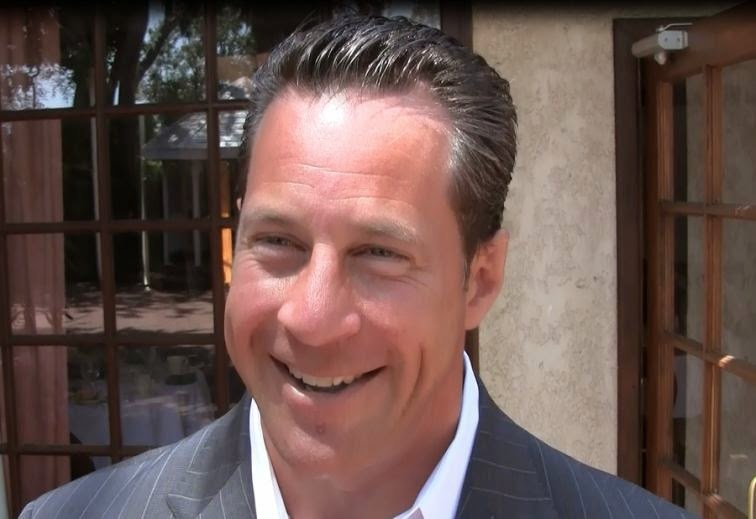 Bigland continues as Head of U.S. 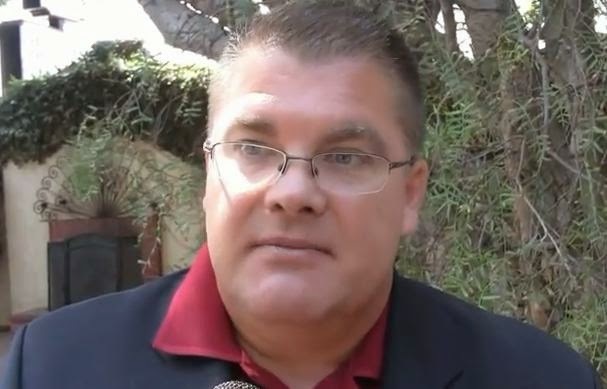 Sales and as President and Chief Executive Officer of Chrysler Canada. He will also continue as a member of the NAFTA Leadership Team and the Fiat Chrysler Group Executive Council. Robert Hegbloom (right), who joined Chrysler in 1986, is appointed Head of Ram Truck Brand after previously serving as the Director of Ram Truck Brand. In his new role, Hegbloom will become a member of the NAFTA Leadership Team. The Toyota FT-1 sports car concept that debuted in January has a new look intended to have more sophisticated feel with a new saddle-colored leather interior styling and exterior color developed by Calty Design Research in Newport Beach, California. Next month two new versions of the FT-1 will be available for download virtually inside PlayStation®3 Gran Turismo 6, the latest iteration of the best-selling racing franchise. Its a concept that the press release calls the "spiritual pace car for the new direction of Toyota Global Design". For now, game on, as we wait for reality to hit showrooms. A one-of-a-kind 2014 BMW i8 Concours d’Elegance Edition sold for $825,000 with Frozen Grey metallic exterior paint, Dalbergia Brown leather upholstery accented with stitching in BMW i Blue, and the Pure Impulse Tera World interior trim accented in BMW i Blue, including the seat belts, as well as having “BMW i8” embossed into the front headrests. The words “Pebble Beach Concours d’Elegance Edition” are laser etched into the door sills. The plug-in hybrid all-wheel drive powertrain combines an electric motor to drive the front wheels and 1.5-liter BMW TwinPower Turbo three-cylinder gasoline engine driving the rear wheels. The BMW i8 is capable of driving on pure electric power at speeds up to 75 mph for approximately 20 miles, producing zero tailpipe emissions. 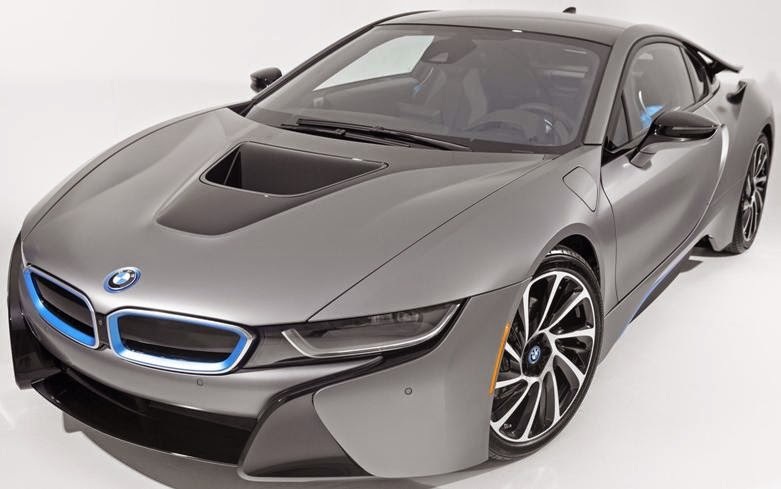 When the gasoline engine joins forces with the electric motor, together they are capacity of propelling the i8 for 0-60 mph in 4.2 seconds and to a top speed of 155 miles per hour. The MSRP for the BMW i8 when it goes on sale is $137,500. The new 2015 Dodge Charger SRT Hellcat will feature the 707 horsepower supercharged 6.2-liter HEMI® Hellcat V-8 engine mated to a new TorqueFlite 8HP90 eight-speed automatic transmission making it the quickest, fastest, most powerful production sedan in the world with an NHRA-certified quarter mile elapsed time of 11.0 seconds on street tires and a top speed of 204 miles per hour. There are five all-new Drive Modes controlling horsepower, transmission shift speeds, paddle shifters, traction and suspension. Drive Modes are pre-configured for Sport, Track and Default settings, while the Custom setting lets the driver customize the drive experience to their favorite settings. Production begins in the first quarter of 2015. The 2015 Chevrolet City Express cargo van with a 2.0L dual-overhead cam inline-four-cylinder engine matched to a continuously variable transmission will offer an EPA-estimated 24 mpg city and 26 mpg highway, resulting in 25 mpg combined. 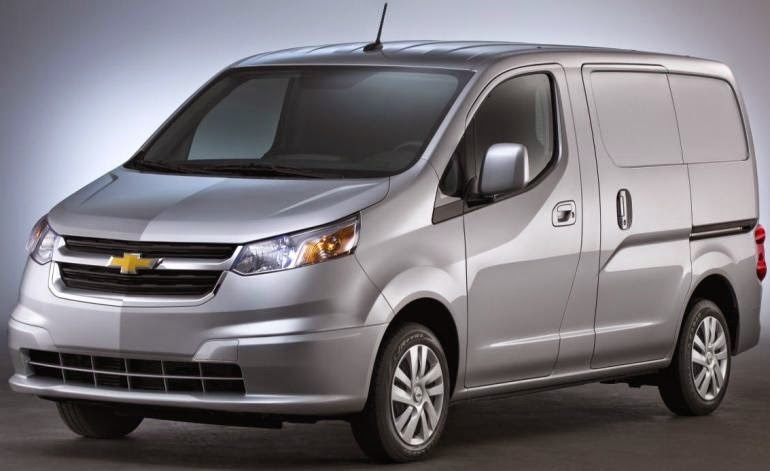 The 2015 Chevrolet City Express LS starts at $22,950, MSRP excluding tax, title, license, optional equipment and dealer fees. Chevrolet’s first entry into the small van segment with 122.7 cubic feet of customizable cargo space and an estimated payload capacity of 1,500 pounds will arrive in dealerships in the fourth quarter. The all-new Volvo XC90 seven-seat SUV, which will be revealed in two weeks in Stockholm, will offer a 316 horsepower T6 supercharged and turbocharged gasoline engine and a T8 twin engine plug-in hybrid at around 400 horsepower that combines a two-liter, four-cylinder supercharged and turbocharged engine with an electric motor, both available for the U.S. market. The XC90 will be the first car in its range to be built on the Scalable Product Architecture modular chassis technology developed in-house, part of Volvo's ongoing 11 billion dollar transformation plan, allowing a wide range of cars, powertrains, electrical systems and technologies, all of differing complexity, to be fitted on the same architecture, generating significant economies of scale. 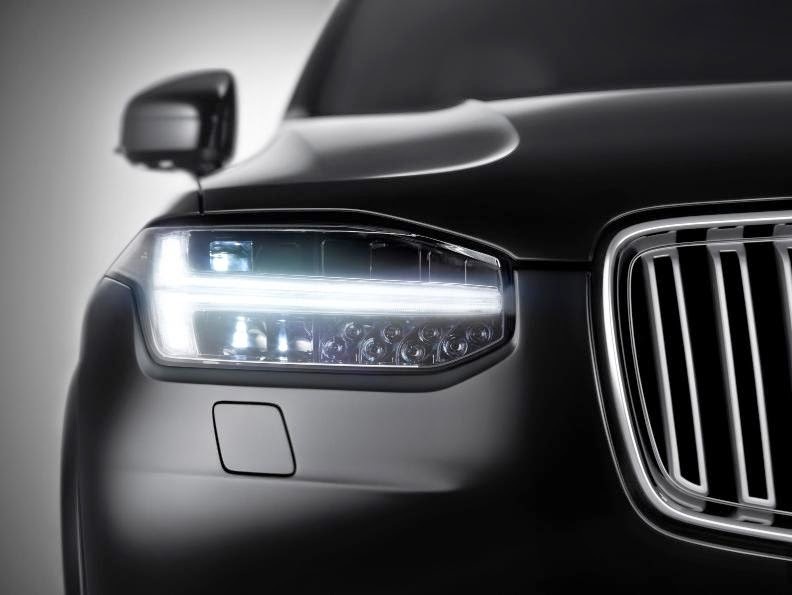 The drum roll for the Chinese-owned, Swedish-designed car company's future has begun. 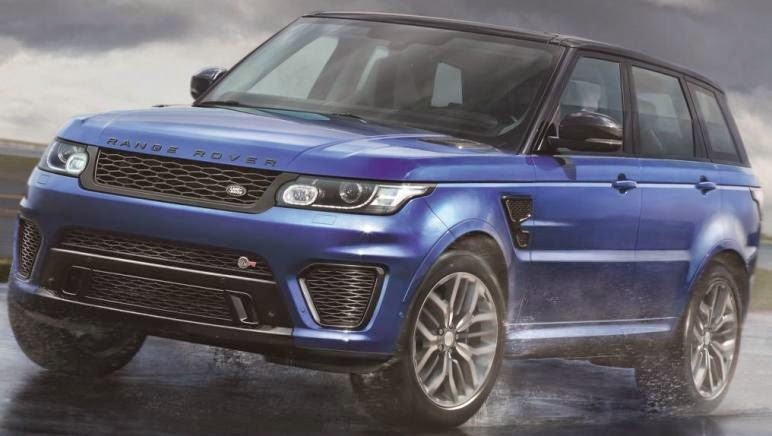 The 2015 Range Rover Sport SVR, with an all-aluminum 550horsepower 5.0-liter supercharged V8 engine mated to an eight-speed automatic transmission with a starting price of $111,400 (including $925 destination and delivery fee), will be the first Land Rover vehicle to wear the new high-performance SVR badge, capable of accelerating from 0-60 mph in 4.5 seconds with an electronically limited top track speed of 162 mph. 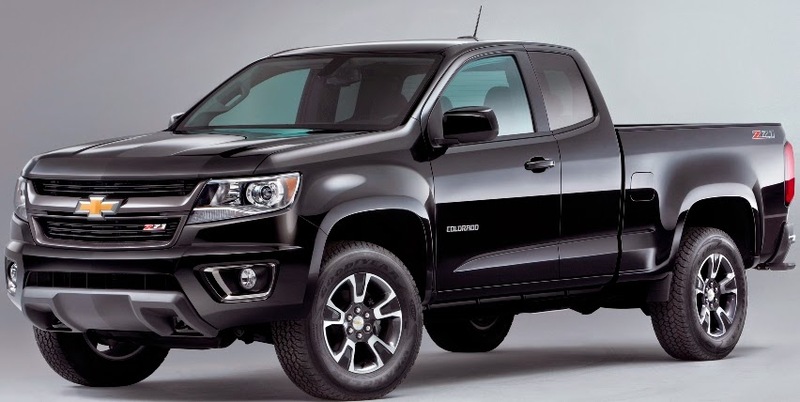 The 2015 Chevrolet Colorado extended-cab pickup with a a 200-horsepower 2.5L four-cylinder engine with direct fuel injection mated to a a 6-speed manual transmission will start at $20,995 (including an $895 dealer freight charge) when it hits showrooms in the Fall. There's a choice of extended-cab models with a 6-foot box and crew-cab with 5- or 6-foot boxes. The Colorado LT crew cab with 2WD and the 5-foot box has a starting price of $27,985 and the Colorado Z71 crew cab 4x4 with the 5-foot box starts at $34,990 (pictured above). Available options will include a 305-horsepower 3.6L V-6, also with direct fuel injection and variable valve timing mated to a a 6-speed automatic transmission, 4G LTE with a built-in WiFi hotspot, Forward Collision Alert and Land Departure Warning and the GearOn™ accessory system. The all-new 2015 GMC Canyon mid-size pickup with a 200 horsepower 2.5L I-4 Direct Injected engine will start at $21,880 (including a $925 dealer freight charge) when it arrives in dealerships this Fall. Available options include the 3.6L V-6 engine with direct injection and variable valve timing, a six-speed automatic transmission, Bose premium seven-speaker audio system, and the GearOn™ accessory system. The SLE trim level starts at $27,520 (2WD extended cab) and a 4WD Canyon SLT crew cab short box model starts at $37,875, and includes the 305 horsepower 3.6L V-6 engine, leather-appointed seating, automatic climate control, 18-inch polished cast-aluminum wheels, remote start and an automatic locking rear differential. General Motors dealers delivered 256,160 vehicles in the United States in July, for the company’s highest July sales since 2007. Total sales were up 9.4 percent compared with a year ago. Retail sales were up 4.2 percent. Year-to-date total sales of 1,712,028 is 3.5 percent higher than a year ago. Retail sales are up 3.1 percent over 2013. Toyota, Scion and Lexus reported July 2014 sales results of 215,802, an increase of 11.6 percent from year-ago month. Toyota division posted July 2014 sales of 188,469, up 10.6 percent over July 2013. Lexus reported July sales of 27,333, up 18.7 percent. Year-to-date Totoya sales are 1,381,409, a 6.1 percent gain over 2013. Ford Motor Company U.S. sales of 212,236 vehicles increased 10 percent over a year ago for the best July in eight years. Retail sales of 162,028 vehicles are up 7 percent. Year-to-date sales of 1,482,268 is 0.3 percent lower than last year. Chrysler Group reported U.S. sales of 167,667, a 20 percent increase compared with sales in July 2013 and the group’s best July sales since 2005. Year-to-date sales of 1,187,790 is 13 percent higher than last year. American Honda Motor reported July 2014 Honda and Acura vehicle sales of 135,908, down 3.9 percent. The Honda division posted sales of 123,428 in July while Acura sold 12,480 in the same period. Year-to-date American Honda sales reached 875,344, down 1.3 percent from last year. Nissan Group announced total U.S. sales for July 2014 of 121,452, an increase of 11.4 percent over the prior year and a July record. Year-to-date sales of 825,929 is a 12.6 percent increase from 2013. Volkswagen of America reported 30,553 vehicles delivered in July, a drop of 14.6 percent from July 2013. Year-to-date sales of 209,697 is a 13.6 percent slide from last year. Separately, Audi reported that its July 2014 sales increased 11.9 percent to 14,616 vehicles, a total that stands as the 43rd consecutive month of record monthly U.S. sales for the brand. Audi U.S. sales year-to-date increased 13.3 percent to 98,965 vehicles. Hyundai Motor America posted its best July sales ever of 67,011, up 1.5 percent compared with the same period in 2013. Year-to-date sales of 431,445 is a 1 percent gain over last year. Kia Motors America announced record July sales of 52,309, a 6.7 percent increase over the same period last year. Kia's year-to-date sales of 349,722 are up 7.2 percent. Subaru of America reported 45,714 vehicle sales for July 2014, a 27 percent increase over July 2013 sales of 35,994. July marks the best-ever sales month in company history, breaking the previous record set in March 2014. Year-to-date Subaru sales totaled 283,722 – an 18 percent increase over the same period in 2013. The company has now seen 32 consecutive months of year-over-year growth and is already on its way to its sixth successive annual sales record. The BMW Group in the U.S. (BMW and MINI combined) reported July sales of 32,220 vehicles, an increase of 7.4 percent from the same month a year ago. Year-to-date, the BMW Group (BMW and MINI combined) is up 5.4 percent on sales of 213,754 in the first seven months of 2014 compared to 202,780 in the same period in 2013. Mercedes-Benz USA reported the highest July retail volumes in its history with 30,757 units sold across the Mercedes-Benz, Sprinter and smart model lines, representing a 16.4 percent increase from the same month last year. July sales for the Mercedes-Benz brand alone totaled 27,192, up 15 percent, bringing year-to-date volumes to a record 178,816. Adding year-to-date sales of 13,697 for Sprinter Vans and 5,998 at smart, MBUSA delivered a best-ever year-to-date grand total of 198,511. Mazda North American Operations reported July U.S. sales of 29,238 vehicles, representing an increase of 17.1 percent versus last year. Year-to-date sales through July are up 9.3 percent versus last year, with 185,669 vehicles sold. Mitsubishi Motors North America had sales of 6,349, a 21.4 percent increase over the sales total from July 2013. Volvo U.S. July sales of 4,897 is a 17.1 percent decline from a year ago and year-to-date sales of 34,228 is 11.1 percent lower than 2013. Porsche Cars North America announced July 2014 sales of 4,300 vehicles. During the first seven months of 2014, PCNA has delivered 27,219 vehicles in the U.S., an increase of 8.3 percent over last year.